National Recruitment Federation Cert RP Graduate of the year Award for 2011 was sponsored by Career Zoo and presented by Brian O’Hoisin and Jackie slattery. Best in Practice National Recruitment Federation 2011 Award for Hotel & Catering industry went to Noel Recuitment. This award was sponsored by The Shelbourne Hotel and presented by Stephen Hanlon, General manager of the Shelbourne. The judges awarded the winner in this category based on the very high quality of standards and service supplied. A clear industry leadership demonstration and the ability to strive forward with new innovations. They felt they were leaders rather than followers in this section and had demonstrated a drive to be first in the industry. Nominated in this category were Noel Recruitment and Three Q Recruitment. O’Reilly Recruitment wins Best in Practice National Recruitment Federation 2011 Award for Light Industrial category. This award, sponsored by Social Talent, was presented by Nicola McCarthy. The winner in this category stood out for the judges. They showed very strong innovative recruitment solutions for this sector. They are going out of their way not only for their clients and candidates but for their Staff as well. They showed how in touch they are with all 3, and the little things they did really made a difference. They provided what the judges noticed was a great local feel and a very smart operation overall. 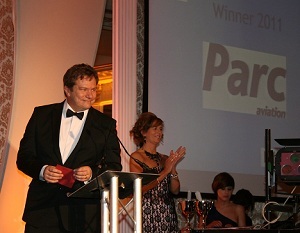 National Recruitment Federation Recruitment Consultant of the Year 2011 Award goes to Peter Nunan from Sigmar. This category was very strongly contested and drew one of the highest entries. The judges had a very hard task as the quality was outstanding this year. The winner stood out strongly for all the judges for their commitment to their role and their all-round professionalism with both candidates and clients alike. They found the winner to be very self aware, articulate and knew what they needed to work on. The winner also understood the importance of standards in the industry and how it was all about people rather than the fee. From a clients perspective knew what was being asked of them and delivered 100%.